Enter your email and we will send you a FREE e-book! The Unshakeable Series and this site is devoted to people empowerment, inspiring change, sharing ideas, thoughts, tools and resources to help you achieve your dreams and goals. THAT YOU WANTED TO PURSUE, BUT DIDN’T? It’s not your fault… society and education has taught us the wrong lessons. There’s good news though, whether it’s getting your dream job, starting your own business, leaving a bad relationship or asking someone out on a date……the strategies are the same and we’re here to teach you. At The Unshakeable Series we are committed to bringing you the secrets to unlocking the success pathways and life pillars to getting ANYTHING you desire. It all starts with the foundation of Self Mastery through Mindset Development and Success. I am a business owner, psychologist, confidence mentor and consultant amongst other things. My focus is to be inspiring change, to help people exceed their potential and meet goals for a more fulfilling and purposeful life. I am pleased that you are here and I hope that I can help you in your self-development. My time and work here is dedicated to bringing you relevant materials, content, online courses and resources that will help you reach ANY dream or goal. Looking forward to helping you achieve your daring dreams. In this fantastic (and free) e-book, The Art Of Self Mastery: Why Your Mind Matters you’ll learn simple strategies that’ll give you the courage and confidence to achieve ANY desired outcome. It will help you discover the rules of your mind for confidence and life success. 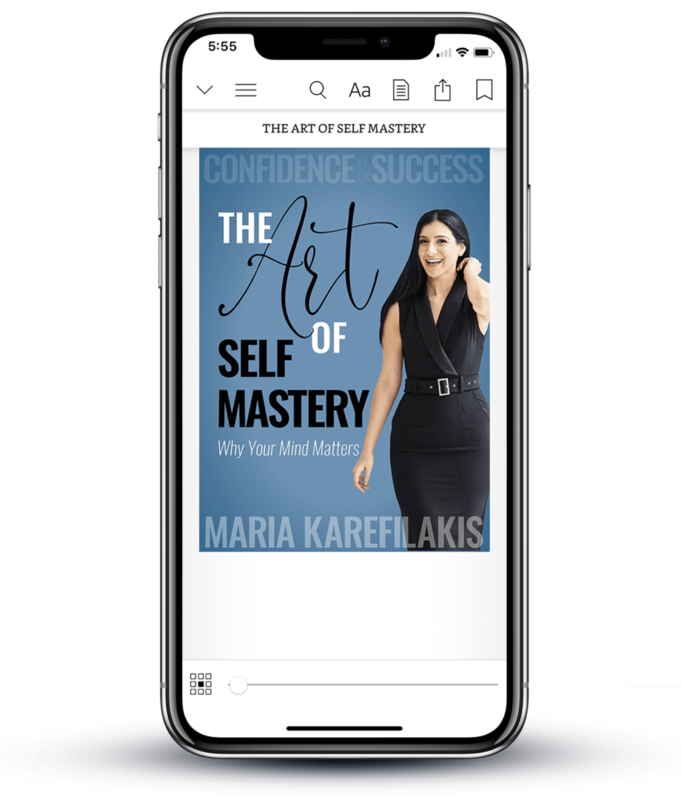 The book was written by psychologist and business owner Maria Karefilakis to help you understand and learn that art of self mastery for unshakeable confidence and success. It walks you through the steps of reprogramming your mind for confidence and helping you let go of all those limiting beliefs you have unintentionally adopted over your life, setting you free once and for all. By the end you’ll confidently take charge of life; slay your way to success and form new habits. No more worrying about what “everyone else” is thinking about you or doing (that’s not your problem). You’ll have an ABUNDANCE mindset & ABUNDANT SUCCESS that you’ve been dreaming of. You’ll be equipped to cope with ANY self-doubt, fear, stress or anxiety so you will never get stuck again (we are only moving now). Your Automatic-Success Mechanism –the ability to achieve ANY goal will be SUPER CHARGED. To instantly download my e-book The Art of Self-Mastery, to get my best free resources and to be the first to know about The Unshakeable Series Programs you can begin by entering your email here. Success! Keep a look out for your email.